He was one of the most feared offensive players of his era. Charley Taylor, a life-long Redskin, was a force to be reckoned with over the course of a storied, 13-year NFL career. Blazingly quick off the line of scrimmage, a fierce blocker, fearless over the middle and a threat to score anywhere, anytime, Charley Taylor played �nasty�. He had it all � speed, size, a penchant for the big clutch play, and an attitude. Number 42 was the prototype for today�s NFL wide receivers, and he made an indelible mark on NFL history, despite playing in an era when defensive backs were free to contest any catch relatively unhampered by interference rules. Standing at the podium in 1984 in Canton, Ohio as he was inducted into the Pro Football Hall of Fame, Charley Taylor no doubt had to wonder at the twists and turns he�d taken to reach that storied position. Born the second of seven children on September 28, 1941, Charley Taylor never envisioned the strange turns his life would take, or the glory he would earn on the athletic field. Taylor grew up in the small town of Grand Prairie, Texas, smack dab between the bustling cities of Dallas and Ft. Worth. Raised by his mother Myrtle and step-father James, Charley was just your average kid. He loved to fish and hunt, and soon found he had a special aptitude for sports. By junior high school, Charley was playing basketball, baseball, football, and running track. Attending all-black Dalworth High School in Grand Prairie (schools were still segregated at that time), he was a standout in both football and track, earning All-State honors in both sports. Taylor first tried his hand at right tackle, at 185 lbs., but eventually moved to tight end as a junior, finally finding his niche in the backfield as a running back his senior year. Despite his success, Charley lived in a time when color still mattered. Taylor would later joke that while the kids from the white high school played in a beautiful stadium across town, he spent his nights playing football in �the toilet bowl�, a less than complimentary description of his own high school�s playing field. As young Charley neared graduation day, there was no film to showcase his football talent. He had doubts his athletic prowess would lead to much of anything, and was giving serious thought to joining the military, something he had tried to do several times before reaching an eligible age. Upon graduation, Taylor enrolled at the University of Southern California. Finding himself barely on Coach John Mckay�s radar and ranked 13th among team running back prospects, Charley decided USC was not for him, leaving the team after just 3 weeks. About to give up on the prospect of college altogether, Taylor was approached by a local grocery store owner, an alumnus of Arizona State, who offered to plead the young man�s case to their football staff. Playing both as a defensive back and running back for the legendary Frank Kush, Charley was a standout, if not a star, for the Sun Devils. His sophomore year, Charley was severely injured during a scrimmage, fracturing 4 vertebrae in his back. But after enduring a frightening period of temporary paralysis, and 6 months in a body cast, Taylor again suited up. In 1962, he led the Sun Devils in scoring, rushing for 8 touchdowns. He was named All-Western Athletic Conference as a halfback, and played in the East-West Shrine Game, the Hula Bowl, the All-American Bowl, and finally the College All-Star game, where he reportedly was told he�d never make it in the pro�s by Coach Otto Graham. As graduation approached, Taylor dreamed of being �the next Jim Brown�. Brown, along with Texas legend Abner Haynes, had been one of Taylor�s childhood idols. In the 1964 NFL Draft, 6�3� 210 lb. running back Charley Taylor was selected by the Washington Redskins with the 3rd overall pick of the 1st round. He was simultaneously drafted by an AFL club, the Houston Oilers (ironically coached for the first and last time that year by another legendary Redskin, Sammy Baugh), with their 2nd round pick. Although the money was better in the AFL, Charley opted to go with the Redskins, a choice that would prove life-changing for the talented young man. In a strange turn of events, Taylor nearly ended up as a Dallas Cowboy. Washington and Dallas were tied for the 3rd selection, and only a winning coin toss gave Washington the nod to select first. Were it not for that bit of good fortune, the Redskins likely would have chosen 4th and selected another future Hall of Famer, defensive back Mel Renfro, who Dallas ultimately selected with a 2nd round pick. Rookie Taylor joined Sonny Jurgensen (acquired in a swap with the Philadelphia Eagles for Norm Snead on April Fool�s day that year) on a horrible Redskins team that had gone 3-11 the previous year under Coach Bill McPeak. In Taylor�s rookie season, the Redskins improved, going 6-8, and Taylor immediately made his presence known. He was named NFL Rookie of the Year (barely edging out fellow star Mel Renfro and teammate Paul Krause for the honor), the first in Redskins history to earn the award. In his inaugural season, Charley rushed 199 times for 755 yards, and 5 touchdowns, and caught 53 passes out of the backfield (an NFL record for a running back at that time) for 814 yards and 5 scores, averaging 15.4 yards per catch. In 1965, Taylor again led the Redskins in rushing. In 1966, Taylor�s career took another unexpected turn as former Coast Guard Academy Head Coach Otto Graham replaced McPeak, and quickly recognized that the player he�d once criticized and labeled as �lazy� was an explosive and dangerous talent. Graham soon realized the best way to utilize Taylor was as a wide receiver, where his speed, size, tenacity, and reckless athleticism made him a constant threat. Midway through the 1966 season, in another twist of fate destined to alter the course of Taylor�s life, he joined Bobby Mitchell and Jerry Smith in the Redskins receiving corps. 1966 was memorable for other reasons as well. By the time the season was over, the newly-designated receiver had wracked up 1100+ receiving yards, with 12 of his 72 receptions going for touchdowns. It was official -- Charley Taylor was a burgundy and gold monster. 1966 was also remarkable for a game played on 27 November, as the Redskins crushed the New York Giants by a score of 72-41 to shatter the NFL record for points scored by a single team, and by both teams combined. Taylor scored two dramatic touchdowns that day, reeling in Jurgensen passes of 74 and 32 yards. 1967 proved that Taylor was just getting warmed up. In record-breaking fashion, Charley, Jerry Smith, and Bobby Mitchell finished 1st, 2nd, and 4th among NFL receivers that year, piling up an astounding 197 total receptions for 2,705 yards and 27 touchdowns. Taylor�s league-leading stats that year included 70 catches for nearly 1,000 yards and 9 touchdowns. Sonny Jurgensen threw 288 completions for 3,747 yards and 31 touchdowns. Perhaps most incredible of all, the 1967 Redskins, despite all that glorious offensive firepower, could only muster a lackluster 5-6-3 record for a 3rd place finish behind Dallas and Philadelphia. Sonny and Charley would prove to be one of the NFL�s most potent passing tandems. They would eventually hook up for 53 touchdown passes, nearly equaling the total achieved by a more heralded future duo, Joe Montana and Jerry Rice. Bobby Mitchell and Charley Taylor also shared a special bond. Mitchell had become the first black Redskin when he was traded to Washington in 1962. He too was a converted running back, and a dangerous offensive threat in his own right. Both men greatly admired the other�s talent, and to this day, each insists the other was the best all-time Redskin receiver. By 1969, Vince Lombardi, who would prove to be one of Taylor�s favorite coaches, had taken over coaching duties. Although the Redskins did manage 7 wins and lots of offensive yards in Lombardi�s only season, the story remained the same as it had for most of the decade. The Redskins were exciting to watch, but unable to beat the elite teams in the league, notably the Dallas Cowboys. But things were about to change. Following Lombardi�s death in 1970, and Bill Austin�s year as interim coach, George Allen came to town, and soon brought in a second QB to challenge Sonny Jurgensen; New Orleans Saint journeyman Billy Kilmer. Kilmer played nearly all of the 1971 season after Jurgensen injured his left shoulder, and led the Skins to their first post-season appearance since 1945. Taylor broke a leg in the 1971 mid-season clash with the Kansas City Chiefs and missed the remainder of that year. 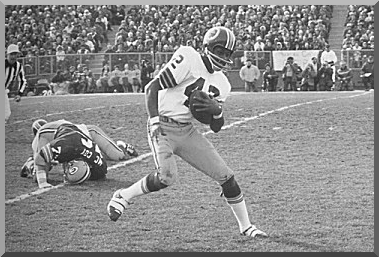 But in 1972, with Jurgensen and Kilmer sharing quarterbacking duties, a healthy Taylor, rising star Roy Jefferson, and Larry Brown led the Redskins in receiving. On New Years Eve of that year, the Redskins played the hated Dallas Cowboys in what was to become one of Charley Taylor�s most memorable performances. Having suffered a 34-24 defeat in Dallas just a few weeks earlier, the Redskins came into the game looking for revenge. As if the NFC title alone wasn�t enough incentive, Allen had his troops fired up. Dallas, led by Roger Staubach, was the overwhelming favorite � few gave the Skins a chance of winning the game, especially with Kilmer at the helm. But Kilmer, convinced he�d been disrespected by Tom Landry in pre-game comments, intended to make the Dallas coach eat his words. And eat his words he did. The Redskins defense put Staubach on the ground six times that day, and allowed only 9 completions. In the 2nd quarter, Kilmer hooked up with Taylor for a spectacular 51 yard reception, and quickly followed up with a 15 yard touchdown strike to Charley. In the 4th Quarter, the game was still in doubt and the Redskins faced a key 3rd down call. Taylor had knocked starter Charlie Waters out of the game earlier, opening a gash in his face that required 12 stitches to close. On the next crucial play, Taylor flew past his replacement, Dallas reserve cornerback Mark Washington, outrunning him for a beautiful (and for Kilmer that was saying something) 45 yard game-clinching touchdown reception. He finished that memorable game with 7 catches for 146 yards. While Taylor would later admit to greatly preferring Jurgensen to Kilmer, in that moment they were forever bound together. The Redskins went on to lose to the Dolphins in Super Bowl VII. Throughout the Allen and Jack Pardee years, Taylor remained remarkably productive and consistent. Now in his 30�s, he still somehow managed to lead all Redskins receivers for 4 straight years from 1972-1975. He was named to the NFL Pro Bowl Team 8 times at 2 different positions during his career (an achievement surpassed by only one other Redskin, Chris Hanburger), and got to share the backfield with boyhood idol Jim Brown one year. During his 13 seasons as a Redskin, Charley had more than 50 receptions in 7 different seasons, and in four seasons had at least 8 TD receptions. Placed on injured reserve for the 1976 season, he tried to return in 1977, but a chronically bad left knee was too much to overcome. Charley Taylor retired at the close of the 1977 season at the age of 35. By the end of his playing career, he had played in 165 games in a Redskins uniform, caught 649 passes (an NFL record at the time) for 9,110 yards, 79 touchdown receptions (90 total touchdowns), sported a 14 yards-per-catch career average, and accounted for 540 total points. Following his retirement in 1977, Charley took a job in the Redskin�s scouting department. Prior to the 1980 draft, Taylor made a visit to Syracuse University, where he spotted a player who looked eerily familiar to him. His name was Art Monk, and he reminded Charley Taylor of�.well�.Charley Taylor. Charley convinced the Redskins front office to draft Monk, and the seeds of a beautiful relationship were sown. Promoted to wide receivers coach in 1981, Taylor would help Monk blossom and ultimately surpass nearly all of his own Redskin and NFL records, showing the same toughness, speed, versatility, and clutch abilities as Taylor once had. Charley Taylor was inducted into the Pro Football Hall of Fame with the class of 1984 (joining fellow Texas Redskin Sammy Baugh, followed several years later by Ken Houston). Ironically, the man who surpassed his incredible feats on the field still awaits that honor. Monk has promised, should he ever receive the honor, that it will be Charley Taylor who presents the award to him. Taylor continued to serve capably in his role as wide receivers Coach throughout the Gibbs era, and for a single forgettable year with Richie Petitbon. When Norv Turner assumed Head Coaching duties for the Redskins in 1994, it was assumed Taylor would be one of the few assistants retained, but this proved not to be the case. After 30 years as a Washington Redskin, Charlie Taylor finally had to say his goodbyes. Taylor is the only Redskin to have been a part of all five of the Redskins Super Bowl appearances. In 1996, Taylor was honored along with a number of other Redskin greats during the last game ever played at RFK. His name has been added to the Redskin�s �Ring of Fame� at FedEx Field in Landover, MD. He is a member of the Texas Athletics Hall of Fame, has been named by Sports Illustrated as one of Texas� �50 Greatest Athletes�, and has been voted into the �Touchdown Club of Washington�s Hall of Fame. In 2002, Charley Taylor was named one of the �70 Greatest Redskins�. He will forever be remembered by all Redskins fans, standing in the endzone after a touchdown catch, arms thrust to the heavens in triumph. Charley Taylor - a game day warrior, a fearless offensive playmaker, and a true Redskin for life. Last edited by Boone; 07-01-09 at 12:00 PM.